Google has added some cosmetic changes to the second beta of this year's version of Android to go with the plumbing it introduced in the first beta. There are subtle differences between these, but the idea is largely the same: a background app requires something from you, but you shouldn't leave your current app. As Google's VP of Engineering Dave Burke explained: "Bubbles help users prioritize information and take action deep within another app, while maintaining their current context. They also let users carry an app's functionality around with them as they move between activities on their device." Pop-up messaging conversations are one instance where the API is useful – some apps such as SMS clients and Facebook Messenger, for example, have featured "chat bubbles" for years. 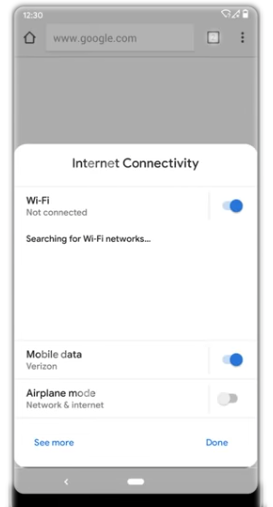 Google also touted the example of a web browser which, on failing to detect a connection, could pop up a form with settings toggles, like so. Bubbles were a rough-edged, undocumented feature of Beta 1, but now get the full treatment. Android Q has also rushed in support for foldable phones, which is important to keep developers from getting too dependent on Samsung and Huawei APIs, resulting in further fragmentation. Samsung and Huawei unveiled their first foldable phones last month. Q Beta 2 supports 7.3-inch (4.6-inch folded) and 8-inch (6.6-inch folded) displays to begin with. And doncha know it? These just happen to be the specs of the Samsung Galaxy Fold and Huawei Mate X respectively. Google continues to toy with basic themes, and is experimenting with a new set of gestures – as yet undocumented. Note the very deliberate hand movements. This Googler may be in distress and attempting to communicate without alerting his captors.